U of MN workers protest opening of $4 billion fundraising campaign, say they won’t be driven into poverty | Fight Back! 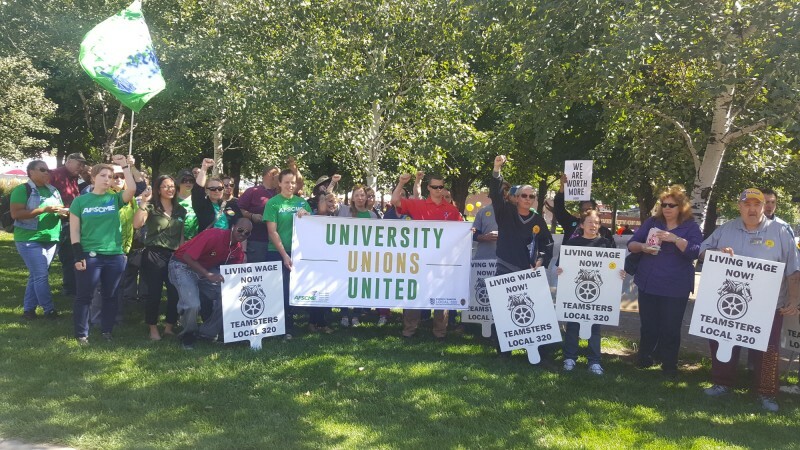 Minneapolis, MN - About 100 members of Teamsters Local 320, AFSCME Local 3800, Students for a Democratic Society (SDS) and others rallied Sept. 8 on the University of Minnesota campus at the McNamara building to demand decent contracts for the university workers’ unions. University officials we visibly shaken by the protest. Speaking at the rally, Cherrene Horazuk, president of AFSCME 3800, stated that university workers would not be driven into poverty.